The Florida A&M University (FAMU) women’s bowling team is working to make it back to its conference championship in the midst of unexpected challenges. This year, the team consists of all freshmen and one upperclassmen, something Coach Karen Brown said can be blamed on timing. “It’s just how things ended up. People graduated, but tournaments are great indicators of our strength,” Brown said. The Lady Rattlers kicked off the second half of the bowling season by competing in the Florida State University (FSU) Seminole Bowling Classic. The Rattlers finished sixth overall with freshman Demetria Bethel averaging one of the top 10 best scores of the tournament. The team's tournament play continued with the Rattler Bowling Invitation Tournament in Pensacola where Bethel finished in the top 20 once again. One of FAMU’s other top performances came from lone-upperclassman Jazmine Aron. “Jazmine is quiet, but she is a monster when the game starts,” Coach Brown said about the third- year engineering student. According to Coach Brown, Aron was forced to be a leader this year because of the lack of upperclassmen. However, she believes the role is helping Aron open up more. "When I'm bowling, everything else is just out of the way," said Aron, who thinks of bowling as her safe place. Aron bowls anchor for the Rattlers, a position reserved for the strongest bowler in the lineup. She is bowling 179 this season, an average she hopes to improve. FAMU officials hope the new bowling equipment in the newly-renovated Galimore Lanes on campus will help Aron and the rest of her team. 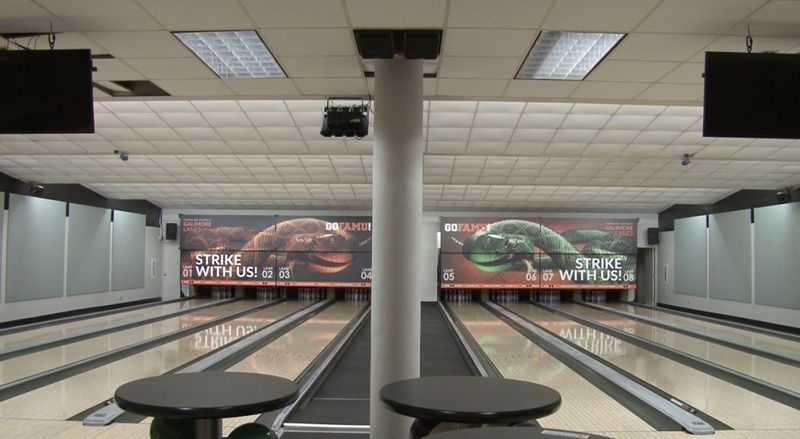 Named after the late FAMU football player, Willie Galimore, the bowling alley’s equipment was replaced with new technology that is expected to help the bowling team as it practices. “When the team is competing, they have a cutting-edge advantage because we can set our lanes on a pro level division,” Prince Winston, the interior designer behind the bowling alley’s renovations, said. of the renovations made to the interior of the alley. According to Winston, the difficulty level of the bowling lanes can be altered in the new alley. The team can lower or higher the oil level on the lanes. The team can also set the pins a certain way to practice certain bowling forms. All the new features are designed to prepare the Rattlers for potential tough competitors and strengthen skills. Aside from the lanes, the alley added new FAMU logos, a new light system and sound system and recreation areas for students. The NCAA only recognizes women's bowling as a sport, and the FAMU women's team is one of only 34 division one bowling programs in the country. The Lady Rattlers compete in the Mid-Eastern Athletic Conference (MEAC) against other historically black colleges and universities. The last time the Rattlers made it to the MEAC Championship was in 2014, a year before Jazmine Aron got on the team. However, Aron said she and her team are eager to make it to the tournament. “I think [the whole team] wants to win, which most athletes do, but I think it’s about really loving what you’re doing and putting passion into it,” Jazmine Aron said. The FAMU women’s bowling team are now focused on earning a spot at the MEAC Championship scheduled for later this month.